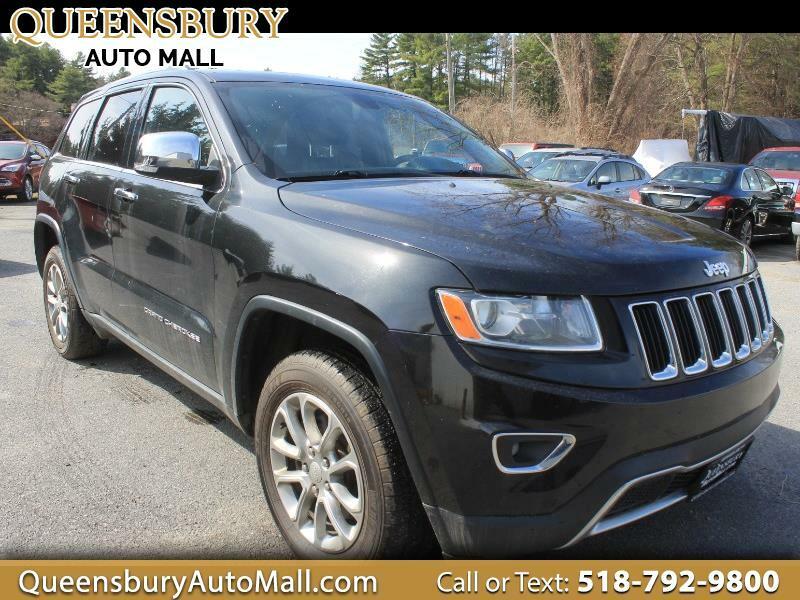 ***REDUCED PRICING - ONE OF THE MOST SOUGHT OUT NEWER STYLED SUV'S COME TAKE A DRIVE IN THIS 2014 JEEP GRAND CHEROKEE LIMITED 4X4 SUV WITH EVERY FEATURE YOU WANT IN YOUR NEW RIDE - UPGRADE TODAY AT QUEENSBURY AUTO MALL LOCATED AT 635 GLEN STREET IN QUEENSBURY, NY 12804 FOR A STUNNING OBSIDIAN BLACK JEEP GRAND CHEROKEE - TRADE IN YOUR OLD RIDE TO SAVE YOURSELF SOME MONEY DO NOT BE SCARED TO TREAT YOURSELF TO SOMETHING NICE WITH THE AUTO MALL FAMILY*** 3.6L V6 DOHC 24V MOTOR! CLEAN CARFAX HISTORY REPORT! HEATED LEATHER INTERIOR SEATING! TILT POWER SUN ROOF WITH SUN SHADE! TOUCH LED HOME SCREEN WITH REAR VISION BACKUP CAMERA AND GPS NAVIGATION SCREEN! TOW PACKAGE WITH TRAILER HITCH RECEIVER AND OVER DRIVE HAUL MODE! FOUR WHEEL DRIVE WITH LOCKING ELECTRONIC TRANSFER CASE! KEYLESS REMOTE ENTRY SYSTEM AND KEYLESS REMOTE START! PREMIUM ALPINE AUDIO SYSTEM WITH AM/FM/CD PLAYER, AUXILIARY INPUT JACK, USB IPOD INTEGRATION AND WIRELESS AUDIO STREAMING! LUGGAGE RACK! POWER DRIVER SEAT WITH LUMBAR SUPPORT! HEATED TILT/TELESCOPE STEERING WHEEL WITH AUDIO CONTROLS, CRUISE CONTROLS AND BLUETOOTH CONTROLS! HANDS FREE WIRELESS BLUETOOTH PHONE CONNECTION WITH CALLING SYSTEM! CHROME EXTERIOR TRIM PACKAGE! TINTED PRIVACY WINDOWS! FULL POWER EQUIPMENT! ALLOY WHEELS ON FRESH TIRES!